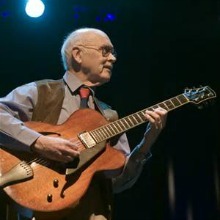 Guitarist Jim Hall (December 4, 1930 – December 10, 2013) would have been 85 years old today. Building on what he absorbed from Charlie Christian, Hall came to prominence in Chico Hamilton’s and Jimmy Giuffre’s groups in the mid-1950s. He went on to collaborate with Ben Webster, Bill Evans, Paul Desmond, Sonny Rollins, Art Farmer, Lee Konitz and Bob Brookmeyer, among others. His versatility and his openness to a wide range of music allowed him to be as effective in third stream music as in the mainstream. Of his own albums as a leader, Concierto has become a classic since it was issued in 1975. The title piece was drawn from Joaquin Rodriogo’s Concierto de Aranjuez already something of a jazz standard because of Gil Evans’ arrangement for Miles Davis in their Sketches of Spain album. For Hall’s CTI version, arranger Don Sebesky sketched out parts for Hall, alto saxophonist Paul Desmond, trumpeter Chet Baker, pianist Roland Hanna, bassist Ron Carter and drummer Steve Gadd. So beautiful. Thank you for the link. What a marvelous and lovely recording this is. Jim Hall and the other players were all exponents of the “less is more” school as exemplified by Pres and others. This is just an awesome version of this famous song. What a trip they take you on! It took a little time for me to enjoy Jim Hall and I’m not proud of that fact. Sometimes you just have to listen long enough and the door opens to a deeper understanding of a particular artist’s gift. Now, if only someone – Mosaic? – would make available all the music that Jim Hall, Don Thompson and Terry Clarke made on 11-13 June 1975 in Toronto. I know that ArtistShare did Volumes 2-4, but that has gone out of print, never to return. And Jim Hall Live! – the one album from those dates – is still in print, which only whets the appetite for more. As far as I’m concerned, this is as important a series of ‘live’ recordings as Ellington at Fargo. Couldn’t we get a petition going? It would certainly be logical for someone to bring together the two pieces –Jim Hall Live!, plus Vol. 2-4 from ArtistShare — but if two companies separately control the rights for them, that will likely be a sticking point. That said, demonstrating that demand exists, whether via social media or other channels, might persuade someone on the supply side. One can always hope. Many thanks. As you say, one can always hope. Wouldn’t it also be nice if a way could be found to revive Ed Bickert’s reputation? Unless I’m mistaken, it was Jim Hall who recommended Ed Bickert to Paul Desmond. A boxed set of Ed Bickert recordings? Any takers out there?